As shown, the endoreversible efficiency much more closely models the observed. 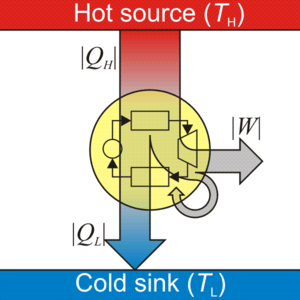 Increase the temperature difference in the heat engine. The simplest way to do this is to increase the hot side temperature, which is the approach used in modern combined-cycle gas turbines. Unfortunately, physical limits (such as the melting point of the materials used to build the engine) and environmental concerns regarding NOx production restrict the maximum temperature on workable heat engines. Modern gas turbines run at temperatures as high as possible within the range of temperatures necessary to maintain acceptable NOx output. Another way of increasing efficiency is to lower the output temperature. One new method of doing so is to use mixed chemical working fluids, and then exploit the changing behavior of the mixtures. One of the most famous is the so-called Kalina cycle, which uses a 70/30 mix of ammonia and water as its working fluid. This mixture allows the cycle to generate useful power at considerably lower temperatures than most other processes. ^ Eman, Mahmod Mohamed (June 2013). "Experimental Investigations on a Standing-Wave Thermoacoustic Engine" (PDF). ResearchGate. Giza, Egypt: Cairo University. Retrieved January 21, 2018.